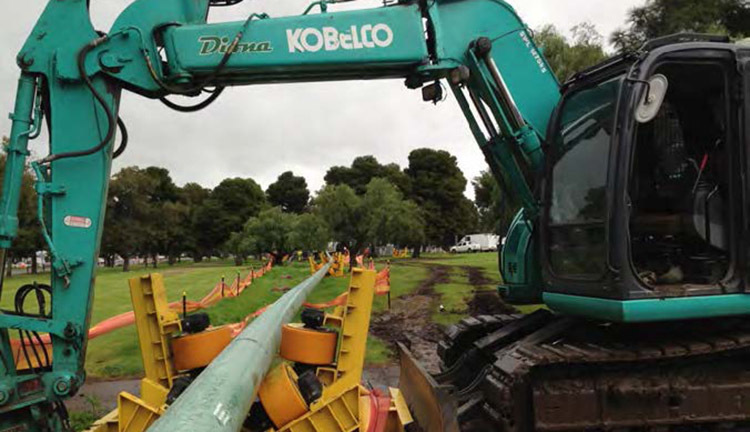 Diona designed, constructed, and commissioned Adelaide’s new Greenhill Road Gas Pipeline, which included 13 horizontal directional drilling (HDD) installations across major intersections, parklands, and rail corridors. The project involved installation, testing and commissioning of a new 6.9km DN300 high pressure gas pipeline via HDD and open trenching techniques. The HDD sections ranged from 55m to 370m in length requiring a significant amount of pre-planning to manage the fabrication of pipe strings, joint coating, pre-hydro testing and pipe installation through the streets of Adelaide city. Diona worked in collaboration with APA to ensure works were completed as safely and efficiently as possible, whilst maintaining traffic flows along busy Greenhill Road. The project presented a number of high-risk elements, which were managed through innovative engineering processes including construction along Greenhill Road, multiple HDD crossings and trenching along a main arterial route, and management of non-destructive testing (NDT) in a highly populated area. The project was completed within the required timeframe and to the satisfaction of the client APA Group.